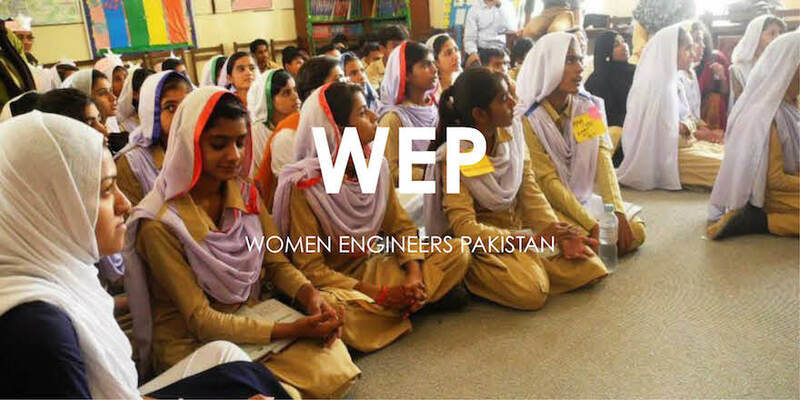 A few months ago, I was contacted by an organization called Women Engineers Pakistan, which introduces girls to the field of engineering and technology. Just reading the name made me curious. For those of you who don’t know, I’m an architect, and I come from a family full of engineers and tech-heads. In other words, my choice of becoming an architect has never, at any point of my life, ever been questioned. I went to a technical high school in Uppsala, Sweden, always with the support of mom and dad, brothers and sister, my grandmother, aunts, uncle and most of all my wonderful grandfather. With 26 boys and 5 girls in my class, the male-to-female ratio was rather high, but my knowledge and competence was never questioned by anyone of the male gender. Not by teachers, nor by fellow students. In this interview, I’ve had the great pleasure of talking directly with Ramla Quershi, the co-founder of Women Engineers Pakistan. She recently moved to the U.S. to study engineering on a full Fullbright scholarship. So even though she’s busy with the big move and getting her bearings, she set aside some time for this interview. I hope you get as inspired by reading this as I did from writing it. Core77: Tell us a bit about the organisation and the thoughts behind it. It started with a Facebook page last August. But it’s wasn’t until six months ago that we started working as an organization. Throughout my engineering degree, I felt a nagging lack of women in this field. We were often discouraged by our professors that engineering is a ‘big boy’ area. It was disheartening to realize that there weren’t many role models set out for us. So I created this organization to give women engineers a platform to represent themselves. When the professors talked about it being a “big boy” profession, how did your fellow male students react to those sort of comments? My fellow males knew that I was good at my studies, so they would often turn up for a group study option and ask me to explain things to them. So they had found out that the women in their class were just as good (some even better) engineers. Barring a few, many were courteous and encouraging. However, there were some ‘go make a sandwich’ sort of comments—but not many. In every part of it—work, education, personal life. I’ve realized that nothing worthwhile comes easy, you have to work tirelessly to achieve it. Which is why I have started a focused approach for the growth of my organization, Women Engineers Pakistan. That we start from school levels, then college and then target workplaces. I have learned that this change that I want cannot be brought about in just a couple of months. It wil take years, maybe decades, to set back this gender gap. And we’re going one step at a time. No, not yet. The schooling system in Pakistan hasn’t changed much over the years. Devising the curriculum is much easier than actually implementing it. I have received both good and bad feedback from schools in Pakistan. The Gov’t Girls High school in Lahore has been most encouraging and have shown a lot of interest in the cause of promoting science and technology. I have gone to that school a couple of times and WEP will arrange a science competition for them next Spring term. However, curriculum changes are a huge challenge. For curriculum changes? No. But we’re getting a lot of help from organizations to set up events, set up promotion desks etc. The Mehran University of Engineering & Technology is one such example. They invited us over for sessions, they invited us as a guest speaker to seminars like Opportunity Deck for Women in Engineering, they have really helped us in spreading the cause. Who runs WEP while you’re in the US? I was hoping you would come to this. I have recruited Campus Ambassadors in major Engineering Universities in Pakistan. The role of these ambassadors is to carry forwad my work while I’m here. They will go to government schools for girls, they will go to colleges, they will arrange conferences in universities. I make the announcement for the selected candidates next week when session starts in Pakistan. Also, supervision is undertaken by Abdul Hadee Janjua, our co-founder. Rafay Qureshi keeps important contacts such as yourself in the loop. Ms. Sidra Kaleem works in Abu Dhabi for us, and she’s already doing a phenomenal job at representation for WEP at coferences there. She is trying to build a job market for Pakistani women engineers in the UAE. Meanwhile, I am in constant virtual contact with everybody. Google hangouts, Skype and Facebook/Twitter are important in today’s digital age. Do you have any Do’s and Don’t’s for girls and ladies who want to work within the field of technology and engineering? – Women generally are better multi taskers. Put this quality to good use. – Be scared of math/physics. Learn things the way you like, but maths is easy once you rid yourself of the fear of it. – Think engineering is only for boys. An engineer uses his/her mind. So can you. What do you mean by “Repeat 1-3 daily”?